What information should I have available to book my event? 50% non-refundable deposit needed to reserve. Balance due in full 7 days prior to delivery. *It is best to guess high if you are not sure on the number of people for your event. This will allow us to make sure that we are going to have enough equipment allotted for your event. How much room do I need for an inflatable? An area of about 20 X 20 that is level and free of rocks, sticks, and animal debris. Sprinkler systems should be shut off prior to event and should have no protruding sprinkler heads. We recommend that the bounce house be set up on grass. Do you set up rental equipment? As part of the rental cost, all tents, bounce house/inflatables and custom back drops are set-up for your convenience. 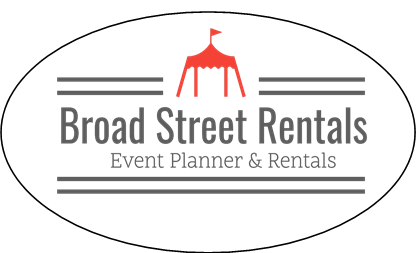 If you wish for Broad Street Rentals to set up your tables and chairs please let us know and for a nominal fee, we would be happy to assist. Typically, we deliver your party and event equipment and do set-up a day before your event, with the exception of bounce houses & inflatables. If you need same day delivery & pickup, or have special timing requirements, please call us. Driver wait time to deliver or pick up equipment is 10 minutes. Beyond this time, Customer will be charged every 15 minutes at $35 per interval per staff. Customer to comply with all municipal, county, state and federal ordinances related to event such as use,safety, required permits unless otherwise stated on contract. The pulling of permits is a service we can provide with minimum 3 weeks advance notice. Service fee plus the cost of permits is paid by the client.